Author: Emma Clayton. Summary: A pair of twins have been separated, one thought dead, but both still feel a link with the other. It proffers unexplainable information as strange things start happening on one side of The Wall – and on the other, the second twin is imprisoned, furious with knowledge of deceit and trickery but unable to react. 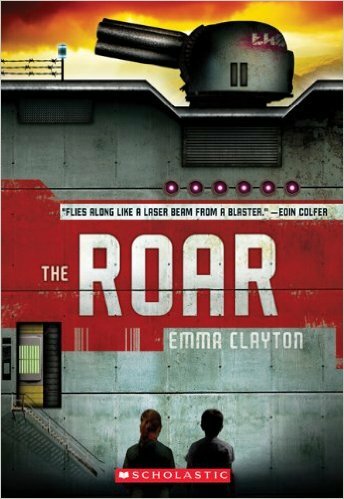 My Thoughts: The Roar seems almost aimed for middlegrade rather than YA, with a simpler and more ‘tell’ style of writing and a correspondingly simple premise/explanation. No doubt its dystopian aspect is what bumped it up. Still, an enjoyable read. Content Review: Sexual content: None. Language: Frag/fragging Violence: Plane fight, two planes are destroyed. Virtual reality games in which airplanes are destroyed. Robot fish and seals are killed. One character is shot in the thigh. One boy nearly strangles another. Mind control via implants. Love Triangle: No.